Nancy Salomon ’68 may have more readers and than any other Rochester graduate who ever lived. An English major from Buffalo whose favorite course was biology, Salomon is a frequent contributor of crosswords to the New York Times and other publications. But that wasn’t always the case. As a student, Salomon didn’t have a clue about crosswords. 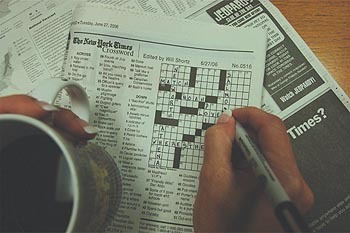 In the early 1990s, Salomon, a systems programmer sidelined by herniated discs, took a course by mail to learn how to create daily crossword puzzles. Her homework was to produce a puzzle, and Stanley Newman, the teacher and editor, purchased her puzzle for publication. After that, Salomon started submitting other puzzles to various publications, focusing on making the 21-square-by-21-square crosswords that often appear in Sunday papers. The puzzles are harder to make than the 15-by-15 puzzles that are offered daily. “I did every thing backwards,” Salomon says. The experience of creating puzzles used to be “solitary,” says Salomon, but the Internet and e-mail have created a cyber community of crossworders. They encourage each other, they answer cries for help, and sometimes they do puzzles together. Within the crossword community, Salomon is known as a gifted coach, someone willing to assist new constructors, including Kyle Mahowald of Florida, who became the youngest person to create a puzzle for the Sunday Times in 2004, when he was 17. Now a student at Harvard University, Mahowald calls Salomon one of the “best teachers” he’s ever had. Salomon says that helping constructors such as Mahowald is its own reward. It has connected her with people she may never meet in person, but people she has come to know and like through the world of interlocking words. Jim Memmott, a senior editor at the Rochester Democrat and Chronicle, is an adjunct assistant professor in the Department of English.